The Lib Tech Box Knife was just a fun freestyle to all-mountain freestyle ride that has a nice take on their C3 camber profile by giving the tip/tail a little early rise. It makes it more floaty and more forgiving than standard C3 while still being almost as dynamic underfoot. I straight up bought this to have it as a favorite to compare other boards like this too and the more I ride it the more I like it. The 2019 Lib Tech Box Knife model is the same as the 2018 model we reviewed so the old review still stands. We try to get as many images of the Lib Tech Box Knife , but forgive us if they're not all there. This is my third board and I've never been so satisfied with riding before. Very playful, dynamic and poppy board, perfect if you like just to jump on every bump, buttering and just stylish riding on prepared slopes. Definitely the board that matches my mind. Thank you Good Ride for your help with my choice! I agree with the previous reviever that keeping speed up is essential with this board, otherwise it tends to spin on its own. Took a few days and embarassing moments to get the mucle memory in place. Excellent edge hold in icy conditions. Great for jumping and buttering. Riding switch with this board is awesome. As stated not a beginner board. I will probably by something else for next year solely due to the slippery feel. Still a good board but not for me. Thank you James Biesty and your friends for the great reviews. C3 in my opinon ist the best carving contour of my boards because the tail grabs the best and sometimes even rescues me from wash outs when I thought it's too late. In case the tail washes out, with the following edge angle increase the edge gains so much grip again, high chances it saves you. I don't know that behaviour from other camber boards. Even on the Custom X I did not experience that. On very soft, fresh snow (slush and dough is kind of okay) I have to carve with more weight in the tail because the front camber tends to cut too deep through soft fresh snow if my weight is centered. The most edge hold is outside the Bindings and a good amount in the center. The standard C3 boards are too aggressive for me for buttering with that long extreme camber about 7mm high under the bindings, it does not forgive any mistake. The early rise shortened and lowered 4mm Camber of the Box Knife just feels about perfect, it forgives minor mistakes but it tells me if I have made one by some kind of edge sticking/grabbing. It feels just like a reminder to stay focused. The Jibsaw is more forgiving and absolute fun to butter because of more rocker and shorter camber with 5mm height just between the outer ends of the inserts (Stickers on the topsheet are not on the right spot IMO). The T.Rice is even more forgiving with just 2mm of camber under the bindings but that huge rocker makes the T.Rice very loose and unstable buttering on harder snow. 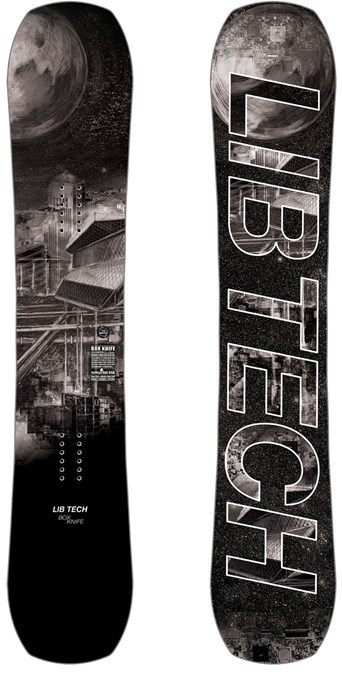 T.Rice reacts much slower but also with very high reliable grip then between the bindings. The Yes Standards Midbite has a good amount of grip but less reliable. The amount of grip changes faster between hard and less hard surfaces. Then sometimes the front edge holds but the back edge slips or the other way around. I prefer the T.Rice on softer snow, the Jibsaw works fine in all conditions and the Box Knife works best on normal to hard snow. All of them are nice in 1 to 2 feet of fresh snow with setback, Box Knife is not as damp as the others, feeling minor vibrations at about 30mph, nothing to worry. It has the most directional stability at speed flatbase. Most pop also is in the Box Knife. Keep the board at speed and you will love it! This board rips! Keeping your speed up is key with this one. The only reason I didn't give it 5 star is because at lowers speeds it gets a bit squirely. I think the contacts are lifted too early. Allowing a little bit more length in the camber section would have made the board a little less auto-spinny on slow flat sections. Edge hold is amazing, stability at speed is amazing. This board is at home on the jump line and decent on the jib line. It was a bit stiff. I’ve not bought a new board For a long time, but it became time to retire the old (nitro) board that I bought on my 2nd holiday 10 yrs ago. I spent a day testing the 2018 boards and approached it with a heavy cynicism thinking that they wouldn’t be much different than the old tech. First thing I noticed was how different the boards perform. I originally had my heart set on a Salomon Assassin, but it wasn’t for me. It just didn’t feel stiff enough for my taste and as I only spend around 10% of my time in the park, something capable of charging all of the mountain, Searching for hits and dicking about in the pow by the side of the piste was much more appropriate for me. I pulled the trigger on this one as it seemed to be the best compromise. It’s been a game changer for me. Within 3 days, I’m riding switch more confidently and competently than I ever had. I’m pushing my (limited) boundaries on tricks without fear of catching an edge. It’s just made my time on the mountain that much more enjoyable.